The Theosophical Society was founded by Madame Annie Besant in the year 1875. The spiritual movement was originally formed in America. The society originated from Chennai city and with in a short span of time spread to the whole sub continent and beyond. The society is located along the Adyar River. The primary objective of the society was to revive the Hindu culture that had been badly ravaged by the colonial rule. The campus of the society is replete with forests. Amidst these grounds are located the buildings and popular worshipping places. 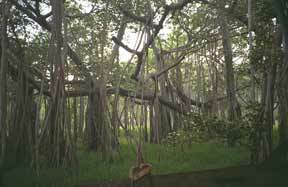 The key feature of the campus is the presence of a very huge banyan tree. The tree alone covers some 40,000 sq. feets of area. The environs contain a number of residential houses, Hindu Temple, Jain Temple, Church and a Buddhist Temple. The place also provides for a library bearing rich collections of manuscripts on all major faiths and sacred books. The Buddhist shrine contained in the campus is one of the key attractions.